I haven't been to Poco Ocean since my days in Coquitlam and that was over 10 years ago. At the last blogger's meal, we "pressured" Jenny (My Secret Eden) into organizing a dinner. She was raving about her meal at Poco Ocean and sensing an opportunity to shirk responsibility, Kim and I threw the organizing torch over to her. She graciously took the reigns. However, either people were busy or they just didn't want to drive out to Coquitlam, there were only 5 of us including Jenny, R, Anita, Kim and myself. So why Coquitlam and particularly this restaurant? Well, legend has it that the Governor of Hong Kong's former chef runs the place. Thus, you know the food should be of a certain quality, even if the place is modest in size and appearance. Honestly, I'm not sure why people always complain that Coquitlam is far away. C'mon, if you lived in L.A., a 1/2 hour drive is nothing. Well, at least those were the complaints I got when I lived in Coquitlam. Maybe they just didn't want to see me! That explains everything... Anyways, Kim picked me up along the way and I became his personal GPS again. Too bad I can't replicate the voice, "in... 400 metres, make a right... at the fork...". We were a little late arriving and it probably put a scare into Jenny. Imagine, a blogger's dinner with only one blogger! That would be my nightmare. Well, maybe not, probably eating again at Kawawa would be scarier! We had to rely on Jenny to do the ordering because she is the only one who can read Chinese. 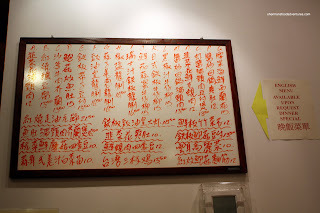 You see, there is a daily menu up on the wall that is purely written in Chinese only. Sure, there is an English menu; but all you'd find in that is Sweet 'n Sour Pork and Lemon Chicken. We wanted the real Chinese food! 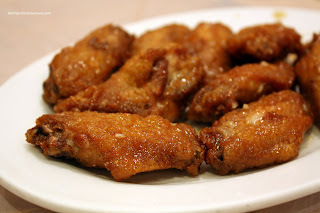 We started with the Honey Garlic Chicken wings and don't get these confused with the ones you'd find in a pub. These babies were not battered, crisp, hot and had only enough sauce to flavour them. A bit sweet, a tad savory and garlicky, this was a nice way to start the meal. Up next was a very large Braised Pork Hock. It was pretty tender with a fatty; yet delicious skin. 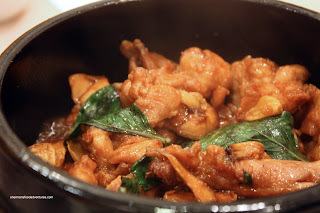 The oyster-based sauce was not too salty and the dish was quite pleasant to eat. The next dish was probably the star of the meal - Three Cup Chicken. A little salty, a little sweet and a bit tart, the pieces of chicken were very tender and I wanted to eat more of it (that's a indication that it's good). The dish was further enhanced by the serving vessel which was a sizzling hot pot. 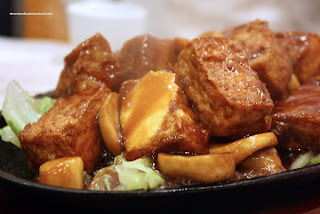 Served on a sizzling hot plate, the Silky Tofu with Scallops and Mushrooms was both hit and miss. 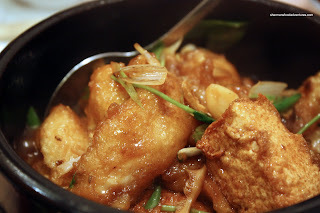 I really liked the soft fried tofu while I disliked the fishy tasting scallops. In fact, the taste of the scallops ruined this dish. I realize that Poco Ocean is a small restaurant and it would be fiscally impossible to acquire fresh scallops every day. However, if it ain't fresh and it detracts from the overall flavour profile of a dish, do not serve it. In fact, this dish would've been fine without them. 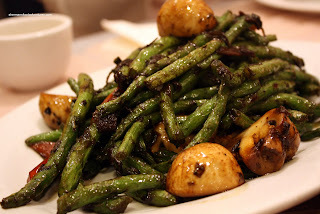 The Stir Fried Green Beans with Snow Cabbage and Mushrooms was an interesting dish. I've never seen this combination before. It was not bad; but nothing about it stood out. I think the beans might've been oil blanched a bit too long as well. The last dish was the Fish and Tofu Hot Pot. 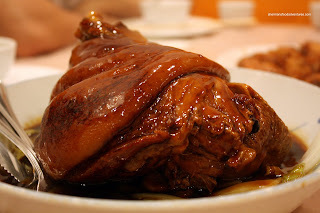 Usually a staple of any Chinese restaurant's menu, this one was a really good version of the dish. The fish was meaty while soft. Moreover, there was just enough batter, meaning there was more fish to eat. The tofu, like the other dish, was soft and fried perfectly. Flavour wise, the dish had plenty of garlic flavour. A tad salty; but it's a whole lot better than being bland. Went well with the rice though. Overall, a pretty good meal. I generally liked all the dishes other than the one with the fishy scallops. Compared to a recent meal at another Chinese restaurant, I can really tell the difference between the two. No comparison. Of course no meal is perfect and this one is no exception. With that being said, it was solid and I enjoyed it (especially with the good company). Hey Sherman, what's up with the date stamp on your posts? You're like three weeks behind the rest of us! Are you blogging from some freaky time-zone or have you entered a wormhole? Oh... Haha... The date stamp is actually the real date I ate at the place. That's why.